One great aspect of expat living in the Middle East is the number of opportunities to indulge in our personal interests. Unlike being in Paris, London, New York or Los Angeles where there are a lot of professional operas, ballet companies, museums and theaters, here the competition is less. As we pursue our high-end hobbies, we find ourselves given opportunities to exhibit and perform nationally. The expats’ summer exodus will begin this month so the various groups are packing in their culture before the year’s end. 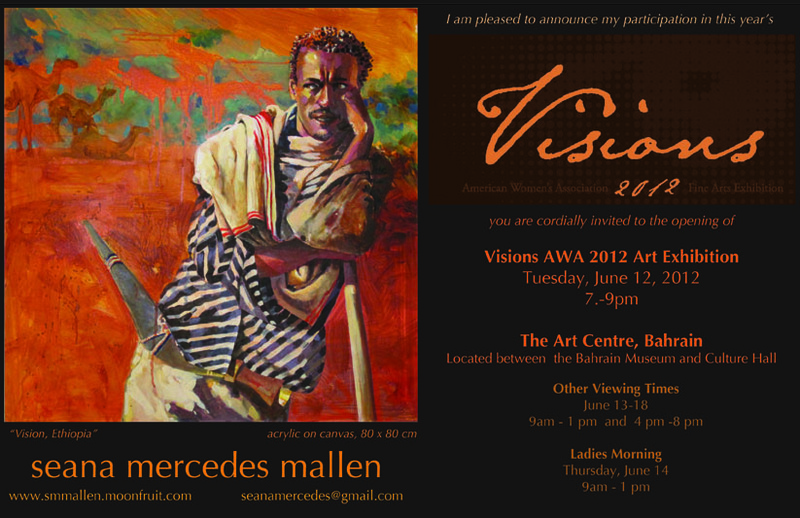 The America Women’s Association’s Visions exhibit runs from June 13-18 at the Bahrain Arts Centre. As is the local tradition, the ladies only morning is June 14th. Since we are traveling to Paris and London to meet some friends, I will miss the exhibit. Artist and teacher to many of the painters, Seana Mallen, sent me some pre-opening photos. I hope the Louvre will make up for it. 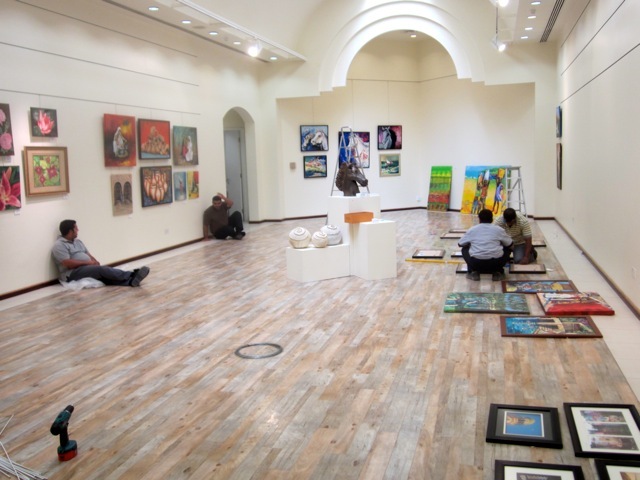 Visions formally opened last night under the Patronage of the Ministry of Culture. 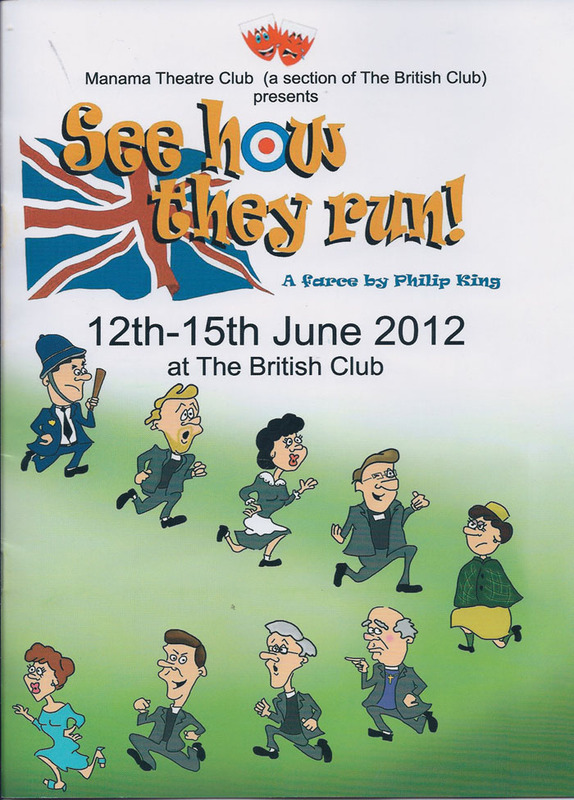 Although I got an invitation, I didn’t go as I was attending the Philip King’s 1943 farce See How They Run at the British Club. This traditional British play made me giggle with its mistaken identities, lot’s of running in and out of doors, an old lady stuffed in a closet, a naked vicar and the 1940s villain, a Nazi POW. The cast members are traditional expat actors – primarily British who have lived abroad for many years and are lawyers, teachers, engineers, university professors, business owners or students by day. They ensured the show was performed despite a public scuffle within the club’s board of directors, six date changes and an entire turnover of the cast. The program said when the original West End production opened in January 1945, the audience did not leave despite three “doodle-bugs”, V-1 Flying Bombers, exploding nearby. The Brits are still unflappable. Neither the actors nor the audience were fazed when a chair leg collapsed and with a loud BANG, a lady dropped on the ground. Leaving the auditorium, assailed by tear gas, I started coughing while the men continued sitting around the pool drinking their pints. See How They Run runs two more nights – Thursday the 14th and Friday the 15th and includes dinner. Tickets are available at the British Club. The boy’s piano teacher will be singing in The Manama Singers Happy Together concert. The Gilgamesh Ballroom will echo with Paul Simon, Billy Joel, Otis Redding and Michael Jackson. Their piano teacher will also be playing in MASK’s Circle of Life, “inspired” by the Lion King. It’s good to see MASK survived despite last year’s front page news that the conductor and the director scuttled off the island together leaving their families behind. Such is the circle of expat life. Just for the record. 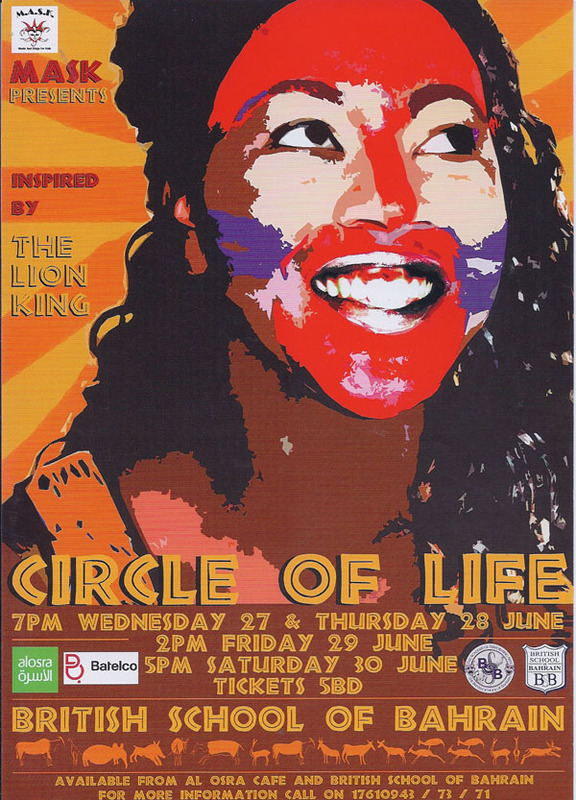 I designed the Manama Singers and the Lion King posters!